This post is a bit long but I thought giving all 25 at once would make the overall doctrine easier to grasp. So, ready? Here it go! That said if anything in this strikes you as particularly agreeable or disagreeable, by all means argue your point. That’s the fun of Philosophy. You learn by keeping an open mind, hearing all the arguments and synthesizing your own educated opinion. 1) If God is perfect, He is always at peace and cannot become angry or upset at anyone or anything because only an imperfect being can be disturbed in these ways. Likewise, if God is perfect, He doesn’t need or want anything from anyone since if He did need or want anything, He would not be God but an unhappy and imperfect being. 2) Death is nothing to us; once the body and brain decompose into dust and ashes, there is no feeling or thought, and what has no feeling or thought is nothing to us. 3) This is the height of pleasure: to be free of all pain and discomfort in both the body and the mind. When this pleasure is present, all pain, of both body and mind, is absent. 4) Illnesses which cause excruciating pain last only a short time and then you are free. Illnesses which cause mild pain may last long but it is possible to live in such a way that the pleasures of life far outweigh the discomforts. Either way, pain is nothing to fear. 5) It is impossible to be happy without also being wise, honorable and honest, and it is impossible to be wise, honorable and honest without also being happy. Happiness is so dependent upon the practice of wisdom, honor and honesty that being negligent in just one of these will lead to nothing but trouble and sorrow in life. 6) Absolutely anything which will keep you from being harmed by people is good and right. 7) Some men and women want to be famous and well-known because they think that this will make their lives safe and secure. If fame brings safety and security, it is good and right to want to be famous; but if a famous life brings more trouble than an obscure life, it is foolish to want what is actually bad for us. 8) There is no such thing as a pleasure that is bad in and of itself. What is bad are the unpleasant consequences that can result if you do not use your head when deciding on which pleasures to pursue and which to avoid. 9) If every pleasure lasted and affected the entire body and not just one or two parts, there would be no difference between one pleasure or another; they would all be equally desirable. 10) If the things which bring pleasure to licentious men and women freed them from troubled minds, that is, if such a life freed them from the fear of God, the fear of death and the fear of pain, and if those things further taught them how to rationally manage their desires, we would find no wrong with these men and women; they would have reached the height of pleasure and would be free of all bodily and mental pain, which is the beginning and the end of all evil. 11) If our peace of mind were not disturbed by superstitious ideas about comets, falling stars and other types of astronomical phenomenon, or by the thought of death (which is really nothing to us), and also by our lack of understanding of the limits of pain and how to rationally manage our desires, we wouldn’t have any need to acquire a thoroughly scientific understanding of nature. 12) An individual cannot be free from the most disturbing fears about the universe as long as he lacks a thoroughly scientific understanding of nature and instead believes in legends, parables and myths. So without a thoroughly scientific understanding of nature, one cannot reach the height of pleasure. 13) There is no point in working hard to achieve physical safety and security from those who can harm you if your peace of mind can be easily attacked and destroyed by fears and anxieties that result from an unscientific understanding of why nature works as it does in the sky, in the earth, or anywhere else in the universe. 14) While some safety and security from others might possibly be obtained if you were to amass great wealth and power, safety, security and tranquility would more certainly be yours if you simply lived a quiet and simple life withdrawn from the world. 15) Understand that true wealth is having what you really need for a happy life and you will find out how easy it is to be completely satisfied; mistakenly believe that wealth consists in possessing all that one could possibly imagine and dream up and there will never be an end to your toil and sweat. 16) By continuously managing the most important matters of life according to the dictates of reason, the wise man or woman constructs a lifelong defense against misfortunes and troubles and seldom suffers from them. 17) The honest individual has more peace of mind than anyone; it’s the dishonest man or woman who always has some reason to worry and feel anxious. 18) As soon as the height of physical pleasure has been reached by the satisfaction of bodily craving, there is no greater pleasure beyond that to be enjoyed; one has reached a plateau that cannot be surmounted. At that point, one can vary the type of pleasure; one cannot increase the intensity. Mental pleasure also has a natural limit which cannot be surpassed and it is this) the peace of mind that results from the rational understanding and pursuit of pleasure and a thoroughly scientific understanding of those things which used to fill the mind with fear and trembling. 19) An immortal life would not provide an opportunity for any more pleasure than this mortal life does. A rational understanding of happiness makes clear the fact that the height of pleasure is attainable here and now, in this life, and it cannot be surpassed, even if one could live forever. 20) If there were no natural limit to pleasure, it would take an eternity to satisfy the infinite number of desires and wants that one could imagine and dream up. The mind, however, is able to discover the natural limit and height of pleasure; it is also capable of freeing us from all fears of any life after death so that we do not need, want nor fear eternity. Therefore, even if the time has come for us to depart from life, we can approach our final rest with the absolute confidence that we have enjoyed all of the pleasure that it was possible to enjoy. 21) The individual who learns what the natural limits of pleasure are knows how very little is actually required to satisfy his or her needs and have a happy life and how easy it is to obtain it. Therefore, it is unnecessary to spend one’s life struggling and slaving away. 22) In all decision making, the criterion should be the ultimate goal of life which we have set before us and the no-nonsense facts of what we actually know and experience (rather than what others wildly imagine) if you stray from this rule, you will be overwhelmed with doubt and confusion. 23) If you deny or dismiss all of the no-nonsense facts of what we actually know and experience, there will be nothing left to serve as a criterion for judging anything, even those views which you state must be false. 24) Absolute confidence in determining what is true and what is delusional is only possible if you learn to clearly distinguish between those ideas which are based upon the no-nonsense facts of what we actually know and experience and those ideas which have their origin in the imagination and nothing more. In other words, if you give the same authority to the imagination and your inner feelings that you give to the no-nonsense facts of what we actually know and experience, you will never be completely sure about anything, as there will no longer be any criterion left to remove your doubt and confusion. 25) If you do not keep the ultimate goal clearly in mind whenever you must decide whether to pursue or avoid a particular pleasure or pain, but decide according to some less well thought out criterion, your behavior will not be consistent with your principles. Fear not Epicureans… Happiness does not reside in the taste buds. I’ve always been fascinated by the Epicurean philosophy. 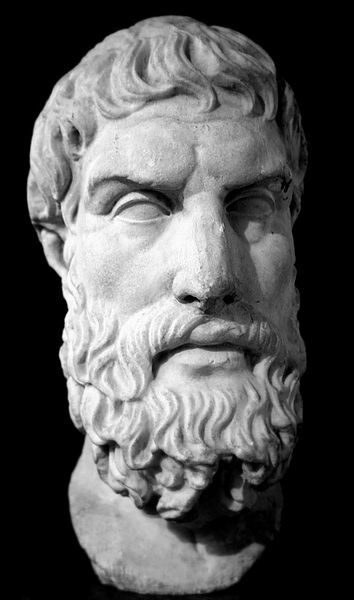 Starting today I’ll try to regularly post some Epicurean teachings for your brain to mull over. Contrary to the ideas of popular culture Epicureans were not hedonists in the same sense as the word is used today. They were, however, hedonists in that they believed pleasure to be the highest goal. The greek ataraxia usually translated as pleasure was not orgasmic pleasure but rather ridding oneself of suffering or pain. It is a state of tranquility brought about by this lack of suffering – be that suffering physical (pain) or mental (fear). I’m going to stop before I extend past my knowledge. I’ll keep studying up! All I wanted to do was share some Epicurean ideas on life. Below is the first lesson in living an Epicurean life. 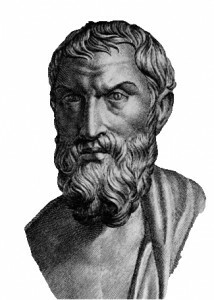 Epicureanism was never meant to be a dry academic philosophy but a vital way of living which would free men and women from a life of unhappiness, fear and anxiety – they sought ataraxia. 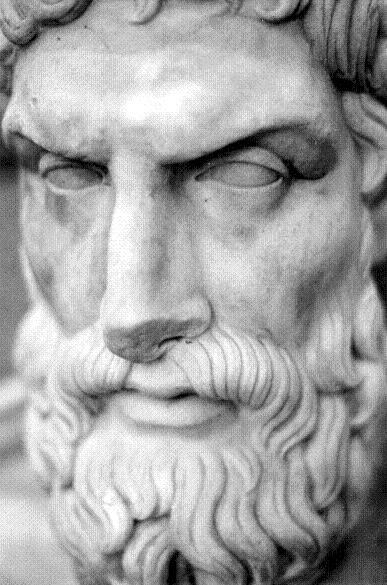 Epicureanism is a missionary philosophy, and while epicureans have written scholarly works, they have always been very interested in explaining this way of life in a manner simple enough for anyone to understand and remember. The following eight counsels are a basic guide to Epicurean living. 2) Don’t worry about death. 6) Make friends and be a good friend. 7) Be honest in your business and private life. 8) Avoid fame and political ambition. As my miniseries progresses I’ll go further into explaining why the Epicureans thought we should accept these Eight Counsels. But for know see if you can uncover their wisdom. You are currently browsing the archives for the Hellenistic Philosophy category.